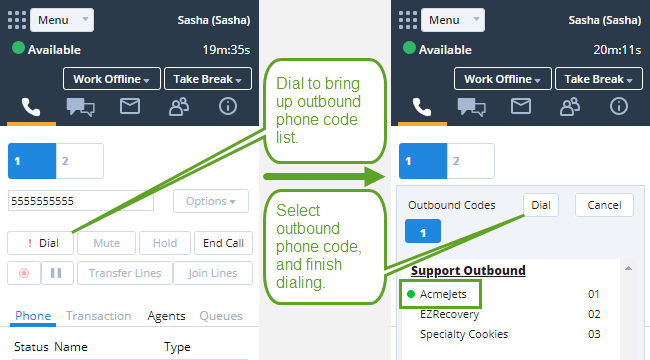 Outbound Phone CodesOutbound Phone codes offer a means to set a specific calling line identifier (caller ID) and optional outbound queue for outbound calls from your tenant. Outbound Phone Codes also may be used to track the purpose of an outbound call. are used for tracking the purpose of a call or for setting a custom Calling Line ID before dialing out. For example, if your Contact Center provides services to multiple companies on the same tenant but on different channels, you must ensure the correct caller ID is applied to each company for best call back experience to the customers. Your contact center administrator may define outbound phone codes to assign caller ID to outbound calls from your tenant. If you are assigned to an outbound phone code list, you are presented with the list when you dial out. You have to select a code to apply the right calling line ID. Dial a number to call, and click Dial in the Control Panel. The outbound phone code list shows. You can select a code from the list. Select a code from the list and click Dial. In a contact center environment, time taken by agents to process calls is critically important. During a call, agents may be required to browse multiple code lists and select desired code/s for each call. This process is time consuming. The keyboard shortcuts for codes minimize the time in selecting the codes by reducing the number of clicks in the call flow. This feature is useful when the agent knows the code selection and does not have to go through the lists to make choices. The keyboard shortcut for Outbound Phone Codes is F2 d nn (sequentially, where d is outbound phone code, and nn is code number). Within each code list, each code is numbered from 01 onwards. To select a second code in the list press F2 d 02. Note: While selecting a code using the shortcut, always choose lower case d or t. Enter the number as 01, not 1.